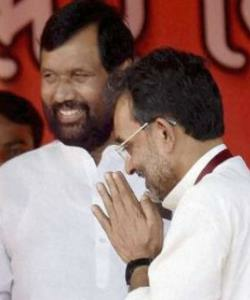 BJP is fighting with Kushawaha, and JDU parties, but things are getting difficult for LJP’s supremo Ram Vilas Paswan. To get rid of this Paswan is all set to maintain a national democratic collaborative format. On the other hand, his son Chirag Paswan, together with CM Nitish Kumar, has been criticising Kushawaha. Sources say that Paswan has discussed with BJP and advised to let Upendra Kushawaha create democratic collaborations as it would keep him busy there. And, that their merger with other collaborated options be the way it is now as other things may create influence. Sources say, Paswan has said, “Upender Kushawaha has a strong grip on the party.” It is also said that BJP is not so happy with the collaboration proposal. Things like “unnecessary hits are created”, “Kushwaha has unnecessarily created a rivalry" are also heard of.